Motorized shades bring many benefits to your home when it comes to both looks and usability. You may already know some of the great benefits Polar Shades’ motorized shades can bring to your home but what about those unexpected benefits you may have never thought about? If are considering whether or not to install motorized shades in your home, these benefits may sway your decision. 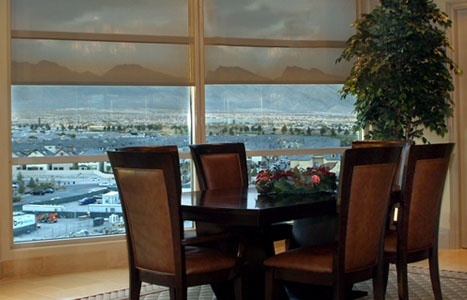 Increased Value - Motorized shades can increase the value of your home. Many homebuyers see it as a great green feature, helping them save on heating and cooling. The convenience is also seen as a plus. Safety - Safety is important and motorized shades take away the danger that can come with the cords on traditional shades. Extra Privacy - If you are looking to add shades to a bathroom or bedroom, being able to just hit a switch and have instant privacy is a nice bonus. Redecorating Excitement - With all the customizable features, from the fabrics to the colors, there is an endless possibility when it comes to redecorating your home. Enjoy Your Home More - Motorized shades can help you get more enjoyment from your home. With a touch of a button, you can control the temperature, look and feel within your home. Add More Romance to Your Life - Motorized shades can give you instant ambiance. If it is too bright for your romantic night in, hit the button and watch your dining room transform into a dimly lit cozy space. Keep More Money in Your Pocket - If you are looking to keep more money in your pocket, motorized shades can help. By blocking the sun's heat during the summer or letting it in over the winter months, you can control the temperature in your home, allowing you to adjust the thermostat. Get That Extravagant Home Theater - If you have a room you have always wanted to turn into a home theater but it seemed too bright, motorized shades can help. Not only can you block light but you can also get an extravagant and plush feeling with just a few decor pieces and your new shades. If you are looking for motorized shades, the team at Polar Shades is here to help. We can find you the right shades that fit your budget and help you through the whole process including installation. Contact Polar Shades today for a free consultation and download our free Shades or Blinds Guide today.